Aer Lingus has transferred four A350 orders to Iberia. At a time when the carrier is looking at acquiring A330 aircraft, the orders have transferred to their sister airline. Iberia is the flag carrier of Spain, while Aer Lingus is the Irish flag carrier. Both airlines are owned by IAG, the International Airlines Group. Formed through a merger of British Airways and Iberia, the group now owns a number of airlines. This includes both full-service airlines such as British Airways and low-cost carriers such as Level. So far Iberia has received three Airbus A350-900 aircraft, the same type that Aer Lingus had ordered. British Airways, who ordered the larger Airbus A350-1000, is expecting their first aircraft delivery to take place later this summer. The change in order status appears to add to the evidence that the A350 may not be the ideal aircraft for Aer Lingus. In fact, the first A350s were initially due to be delivered 5 years ago back in 2014. Instead, it looks as though the airline may, instead, be looking at the A330. This is according to the IAG Capital Markets presentation from 2018, which shows the airline wants to acquire four more A330 aircraft. In fact, this same presentation shows no place for the A350 in the future Aer Lingus fleet for the next four years. The airline is also looking at phasing out its Boeing 757 aircraft as new A321LR aircraft are delivered. What about the other five? It’s unclear what will happen to the other five A350 aircraft still on order by Aer Lingus. They remain in Airbus’s order books as the A350-900, the same type that Iberia has ordered. 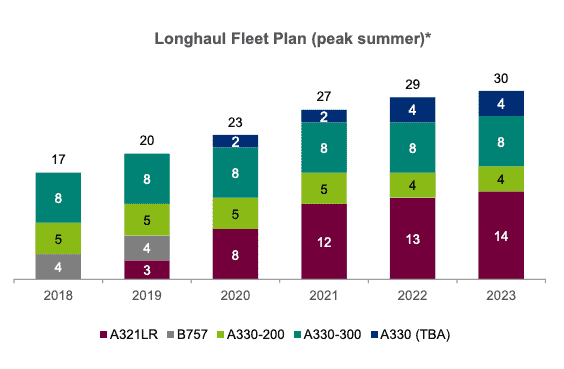 The Aer Lingus long haul fleet plan only goes as far as Summer 2023. As such, there is the possibility that Aer Lingus could look to implement the aircraft after this date. The other options available include transferring them to another IAG airline, selling them, or cancelling the order at a cost to the airline. It seems unlikely that British Airways would pick up the order as they have instead ordered the larger -1000 variant of the aircraft. That leaves Iberia which does operate the -900. Do you think Aer Lingus will keep its remaining A350 orders? If not, what do you think will happen to them? Let us know in the comments down below! The A330 neo makes more sense for Aer Lingus…better to have a uniform longhaul fleet. Aer Lingus has no need for the A350’s range, and it’s questionable whether they need the extra seat capacity per airframe. The A330 neo is also cheaper, which will help Aer Lingus to continue offering very competitive transatlantic prices. Guessing this allows Iberia to accerate the removal of lovely 4 engined A340s potentially. Sadly! In answer to your question, if the contract allows, I believe that they will either transfer them or just start postponing delivery and see if eventually Airbus will let them switch them for A330s. If they could economically cancel them, I think you would have seen that happen already. I think the transfer to Iberia is because the planes are much more efficient than the A340s that they will surely replace, but in general seems the A350 seems to have really fallen out of favor with airlines in general. Its not extremely good of fuel, and does not allow for carrying much extra freight to help make money. The A350 was designed as a B777 competitor/replacement and has done so in capturing a significant portion of the B777-200ER’s market. It is not the right comparison against the B787 nor the B777X as it has its own range of target markets and uses.